Reducing your cell phone bill is one of the easiest ways to lower the amount of money you spend each month. However, you may not know how to find cheap cell phone plans, or you may think some are just too good to be true. There was a time when only four big carriers operated, and they offered a restricted range of plans but those days are over. Several mobile virtual network providers have emerged, and they run off Verizon Wireless, T-Mobile, Sprint, and AT&T. They offer cheaper alternatives for people who want to spend less on minutes and data. It’s even possible to get free cell phones or subsidized data plans. If you’ve had the same plan for years, it’s time to see what else is available. You can find deals for both individual and family plans. Many of them are contract-free so you can choose only the features you need. This article will highlight 13 cheap cell phone plans you can try and offer some tips on how to choose the best plan for you or your family. Looking for more ways to save money? Check out this article on what money habits you should develop to save more! If you want a cheap cell phone plan which offers lots of flexibility, you should consider this one from Republic Wireless. This plan includes unlimited talk and text for $15 and optional high-speed LTE data for $5 per gigabyte. The data is offered on Sprint or T-Mobile’s networks. If your data needs vary from month to month, this is a good deal. You can purchase 1GB when you need it. If you reach your limit and need more data, you can add another gigabyte through the Republic Wireless app. This is cheaper than paying for a large amount of data each month when you don’t always need it. You just need to make sure the company offers coverage in your area. Click here to get a $20 plan from Republic Wireless and reduce your cell phone costs. Project Fi, which is operated by Google, also offers a plan with starts at $20. That base fee includes unlimited calls and texts. You can then choose the amount of data you want for $10 per gigabyte up to 6 gigabytes. After that, your data is free for the rest of the month under Google Fi’s Bill Protection for individual plans. However, if you use more than 15 GB in one month, your data will be slowed. Project Fi connects to three mobile 4G LTE networks and more than two million secure Wi-Fi hotspots. Phones designed specifically for this brand automatically switch between networks. You can roam to more than 200 countries and territories and get free unlimited texting, low-cost calls, and the same data prices you get at home. This is one of the best cheap cell phone plans on the market. Who knew saving money can be fun? Click here to sign up for Long Game and start saving and earning more by playing games and claiming rewards! If you want to find cheaper cell phone plans, you can consider Red Pocket. Their $15 plan includes 1000 minutes, unlimited texts and 1 GB of LTE data. Red Pocket works with any of the four major networks. If you already have a phone from one of the leading carriers, you can keep your number if you wish. Red Pocket offers free international calls to more than 70 countries so if you make lots of calls to relatives or friends overseas, it’s an excellent option. There are no contracts, credit checks, overage fees or activation fees involved. As far as cheap cell phone plans with data go, this is a good option. For even more ways to save money by getting fit and healthy and earning more, check out HealthyWage. Most senior citizens don’t need large amounts of data, so such plans are usually a waste of money. They usually rely on their cell phones mainly for important or emergency calls. If you’re older or you’re shopping for an elderly relative, consider a plan from Consumer Cellular. They offer plans specially targeted to people over 50. In fact, customers benefit from a five percent AARP discount on their monthly service. For around $20 per month, older customers can get 250 minutes, 250 megabytes of data and unlimited text. You can take your own device or purchase one from Consumer Cellular. They offer flip phones with larger buttons which are easier for older people to use. Click here for more tips on how seniors can get a low-cost or free cell phone! If you are in dire need, you may be able to get a free cell phone and subsidized service. Simply Cellphones offers access to the federal Lifeline Assistance Program. This is a program which helps low-income families get access to affordable cell phone services. People who are living on social security benefits or food stamps or relying on another form of government assistance are generally eligible. Through Simply Cellphones, you can get a free phone which is often refurbished. The Lifeline program provides a discount of $9.25 per month through participating cellphone companies. This subsidized cellphone can help you to look for work, access emergency services and stay in contact with relatives. Click here to see if you qualify for a free cell phone through Simply Cellphones. Total Wireless offers a $35 plan with unlimited talk and text, and 5GB of data. The company uses Verizon’s network so you can expect excellent coverage nationwide. You save five percent on the cost of the plan if you sign up for auto-refill. If you bring your own number, you get 50 percent more data. None of Total’s plans require a contract. In your search for cheaper phone plans, this is one you should consider. So far we’ve only discussed cheap cell phone plans for individuals. Cricket is a subsidiary of AT&T which offers budget-friendly options. If you need a family plan, Cricket Wireless offers an excellent package. For $100 per month, you get unlimited talk, text, and data for four lines. Unlimited texts to 38 countries are also included along with calls and picture messages to and from Mexico and Canada. A similar plan from AT&T would cost around $180 so this is an easy way to save at least $80 monthly. With the Cricket Wireless plan, data speeds are limited to 3 Mbps and video streams at around 480p. Cricket may slow speeds if your family uses more than 22GB of data. Click here to learn how to make more money with the help of apps on your phone. If you have minimal needs, you may actually be able to get a free plan. FreedomPop is a startup offering an absolutely free plan that includes talk, text, and data. Of course, this option has its restrictions. You get 500 texts, 200 minutes and 500 megabytes of data. This plan is only available in certain areas so you will need to enter your zip code on the site to see if you are eligible. FreedomPop also offers free or heavily discounted phones. If you choose one of the paid plans, you can downgrade to the free one at any time you choose since you are not bound by a contract. Ting says its customers pay an average of $23 per month per phone. There are no start-up fees, plans or contracts involved. You can even get $25 in credit to try the company for free. Ting customers get nationwide LTE coverage from two carriers. When you sign up with Ting you only pay for what you use. However, you first need to ensure that they support your phone. Ting charges $6 per line and then you add the minutes, data and texts you need. At the end of the billing cycle, you pay for what you have used. You can set alerts and usage caps, so you know when you are reaching your limits. There is no extra cost for calls to more than 60 countries. Interested in more ways to make money to fund your new cell phone plan? Click here for 100+ tips. If you absolutely need a lot of data, it is best to get an unlimited plan. This way, you don’t have to worry about going over your limit. Unlimited data doesn’t have to be expensive and some plans can offer great value. Boost Mobile offers unlimited talk, text, and data for $50 monthly. You also get 12GB of mobile hotspot data and HD video streaming up to 480p. You can also get BoostTV which offers live broadcasts and on-demand programming. While many mobile service providers don’t include taxes and fees in their rates, Boost does. This means you really do pay $50. This plan does not include international roaming but if you don’t plan to travel extensively, this shouldn’t be a problem. If you ever need an international plan, you can add it. There is no annual service contract. If you want an unlimited family plan, you should consider this option which is being offered for a limited time. You pay $20 per month per line for five lines if you switch to Sprint. You also get unlimited text, data and talk nationwide along with unlimited talk and text, and 5G of LTE data in Canada and Mexico. Global roaming is available in most countries. Sprint also gives you a 500MB mobile hotspot and Hulu access. If you are a Veteran or member of the U.S. Armed Forces, there is a special Unlimited Military Plan. Mint operates on T-Mobile’s network and it offers an interesting take on prepaid mobile solutions. Instead of a monthly plan, this carrier offers three-, six- and 12-month packages. This means the plans are discounted quite heavily if you calculate them on a month-by-month basis. Data packages are available in 2GB, 5GB and 10GB allotments. If you opt for a three-month plan, you benefit from an introductory offer of $45 for 2GB of 4G LTE data, $60 for 5GB and $75 for 10GB. The carrier gives you unlimited talk and text and allows you to turn your device into a mobile hotspot. Mint does not offer phones so you will need to bring your own GSM-enabled device. For a lot of amazing money-saving tips and ideas, click here! If you’re looking for a pay-as-you-go plan, you should also consider H20 Wireless. They offer 30-day, 90-day, and 12-month pans. The 30-day plan costs $25 or $21.25 with auto recharge. You’re charged 2.5 cents for talk and text and ten cents for data and MMS. You get a 15 percent discount if you opt to recharge your plan automatically but this is reduced to ten percent after three payments. Once you recharge before your airtime expires, your unused balance will be carried over. You should note that with H20 if your account balance runs out, you will only be able to call 911. You have to add money to your account in 30 days or your account will be canceled. If that happens, you lose your phone number. 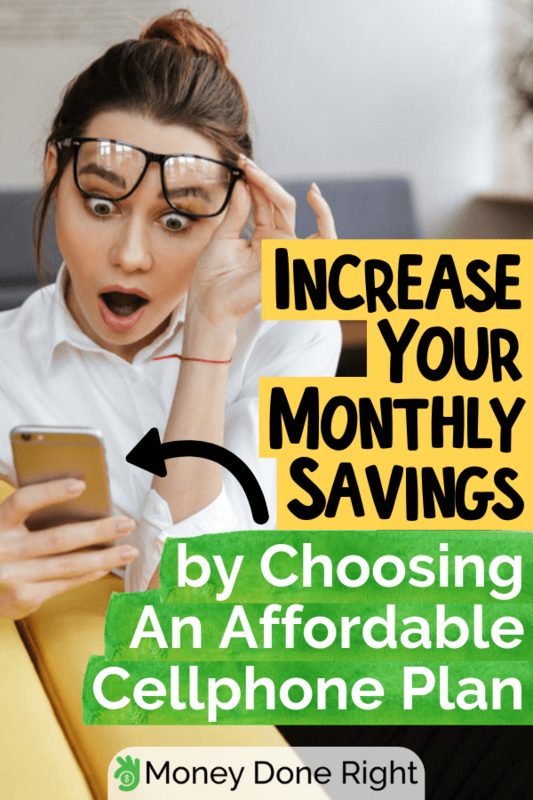 While you want to save money on your cell phone bill each month, you also need to make sure you choose a plan that’s realistic. Data is the feature which tends to drive up costs. You should, therefore, start by finding out how much you or your family use each month. You can check your phone for this information or call your current carrier. Determine how much you can cut back your usage by and then find a plan that fits. If you are really strapped for cash, you may have to choose one of the cheaper phone plans available in your area and reduce your usage drastically. The important thing is to be honest with yourself about your requirements. If you go over your limit every month or you get a basic plan than splurge on add-ons, you will not see a lot of savings. There are a number of things you can do to scale back your data usage while on a cheap cell phone plan. For example, you can download podcasts and music to your phone when you have access to Wi-Fi and then listen to them whenever you want. Apple’s Podcasts app, Spotify, and Soundcloud all allow you to do this. Of course, your phone will need to have enough storage space. If you have a higher-end phone with lots of storage but you don’t want to spend a lot on data, this is the way to go. If Google Maps is what drains your data, you just need to be a little more proactive. When you have Wi-Fi, input the destination and choose your route. The navigation will continue to work when you’re no longer on Wi-Fi. Even if you make a detour, you can see your location on the map and get back on route. For more tips on how you can save money while continuing to spend, check out this article. There are several apps you can use to communicate for free either on your data plan or Wi-Fi. These include Whatsapp, Facebook Messenger, Viber, and Skype. You can make regular voice calls or choose the video option if you want to see your loved ones. You just need to make sure the people you want to contact also have the app. If you want to make regular telephone calls, especially internationally, Skype also allows you to do this affordably. As you can see, purchasing cheap cell phone plans means you need to get a little more creative in how you use your phone. However, you can still enjoy all the features if you plan accordingly. When you decide on a cheap cell phone plan, make sure you use these tips to help keep your data usage to a minimum. If you want to save even more money, try this 14-day challenge. What do you do to reduce your cell phone bill? How easy is it to find cheap cell phone plans that meet your needs?